It all started with a pile of cash. Literally. During one of our negotiation classes, everyone in our Michigan Ross Weekend MBA class was required to put in $5, and then compete against one another in teams. The best negotiating team would take home the cash, and, presumably, spend it on coffee to get through exam week. But instead, we asked to donate it to charity. And then, because we’re business students, we wondered how we could make that small sum of money grow. In just two years, we have grown personally and professionally as part of the Ross program, and we want to continue to make a positive difference, both in our careers and in our personal lives. And so, our class has decided to Give 1 Back. Roughly a third of our class has pledged to give at least one percent of our incomes for the rest of our lives to charitable causes. We believe we can make a lasting and growing impact in the lives of others, and this is just the start. We’re also launching a fundraising campaign to support the Charles Woodson Fund, an initiative that is part of the C.S. Mott Children’s Hospital. The Charles Woodson Fund helps pay for research to solve uncured childhood diseases that would otherwise go unfunded. 66 of us -- two-thirds of the Weekend MBA class -- have pledged to give $200 each to help fund this important cause. Several of us visited the C.S. Mott Children’s Hospital to tour the facilities and to hear about how the hospital supports families during very difficult times. It was inspiring to see photos of children who were once in intensive care and are now older and living healthy, happy lives. Other classmates volunteered at the hospital to help serve dinner to families staying at the hospital. For us, it was humbling to be reminded that the challenges we face in business school are nothing compared to the struggles these families go through. We give because we are fathers, mothers, sons, and daughters. We give because we believe it’s the Michigan way. And we give because we believe leaders can and should make a positive difference. Our class has pledged to match up to $15,000 of donations to the Charles Woodson Fund, made between now and April 29, when we graduate. We have already raised more than $5,000 in our first three days. 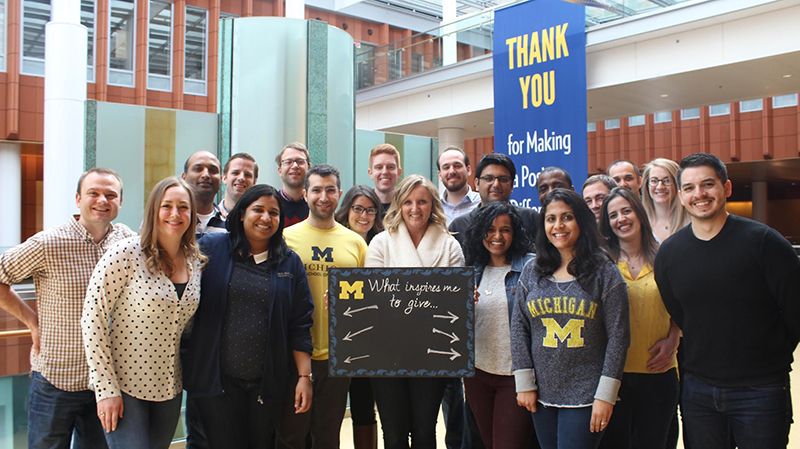 This post was written by members of the Michigan Ross Weekend MBA Class of 2016. To donate to the Charles Woodson Fund and have your donation matched by the class, please visit the team's giving website.